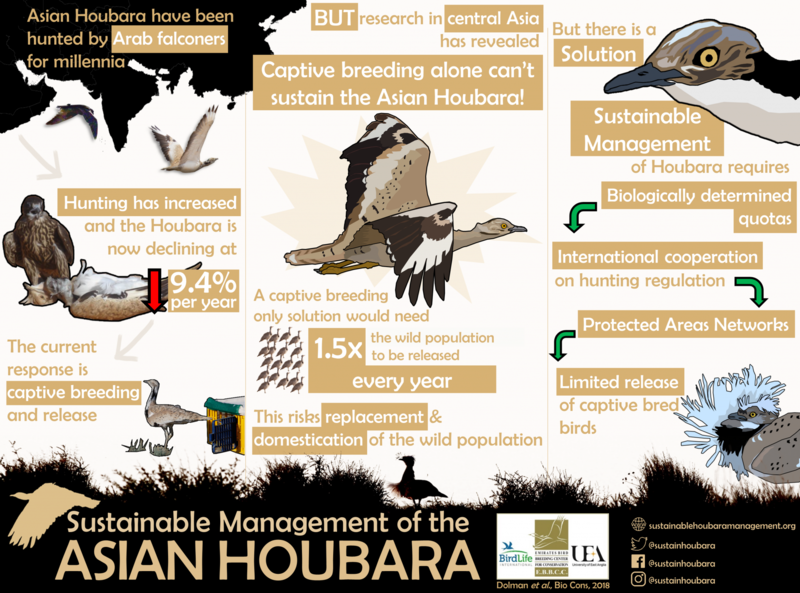 Our research focuses on answering questions that can support conservation and sustainable management of Asian Houbara and other bustards. Publications are freely available below. Captive breeding cannot sustain migratory Asian houbara Chlamydotis macqueenii without hunting controls. To evaluate the potential contribution of captive breeding to the conservation of exploited migratory Asian houbara Chlamydotis macqueenii, we estimated release numbers required to stabilise a population in a hunting concession (14,300km⁠2), under scenarios of local licensed hunting and flyway-scale protection. We developed a population model, initially 2350 adult females, re-sampling parameters measured through fieldwork and satellite telemetry, over 1000 iterations. With current flyway-scale unregulated harvest, and without any licensed hunting in the concession, populations declined at 9.4% year⁠⁠−1⁠ (95% CI: −18.9 to 0% year⁠−1); in this scenario a precautionary approach (85% probability λ ≥ 1.0) to population stabilisation required releasing 3100 captive-bred females year⁠⁠−1⁠ (131% of initial wild numbers). A precautionary approach to sustainable hunting of 100 females year⁠⁠−1⁠ required releasing 3600 females year⁠−1⁠ (153% of initial wild numbers); but if interventions reduced flyway-scale hunting/trapping mortality by 60% or 80%, sustaining this quota required releasing 900 or 400 females year⁠⁠−1⁠, 38% and 17% of initial wild numbers, respectively. Parameter uncertainty increased precautionary numbers for release, but even with reduced precaution (50% probability λ ≥ 1.0), sustainable hunting of 100 females year⁠⁠−1⁠ required annual releases of 2200 females (94% wild) without other measures, but 300 (13%) or no (0%) females under scenarios of a 60% or 80% reduction in flyway-scale hunting/trapping. Captive breeding cannot alone sustain migrant populations of wild C. macqueenii because it risks replacement and domestication. Trade and exploitation must be restricted to avoid either extinction or domestication. For exploited populations, supplementation by captive breeding should be used with caution. The data shown in this article are the number and proportion of deaths attributable to hunting/trapping, powerline collisions and natural causes in migratory Asian houbara Chlamydotis macqueenii originating from a breeding population in Uzbekistan. 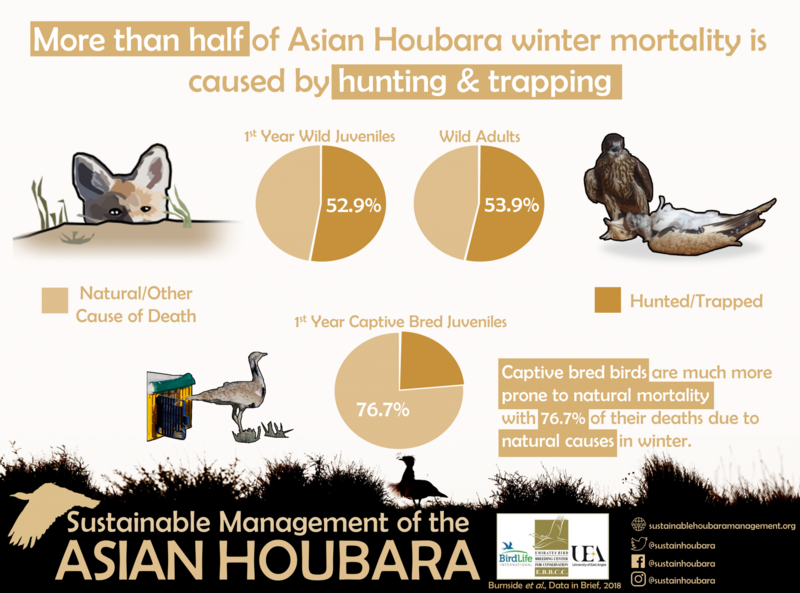 For wild adult and juvenile Asian houbara wintering in Central Asia during the period 2011–2018, 53.9% and 52.9%, respectively, of mortality was due to hunting/trapping, while in contrast most mortality in captive-bred released birds was natural with only 23.3% attributable to hunting/trapping. In winter, only one instance of powerline mortality was confirmed (6.0%). For wild adults, 23.0% of mortality during the summer was due to hunting/trapping, while 30.7% was due to powerline collisions. This data article is related to the publication “Captive breeding cannot sustain migratory Asian houbara Chlamydotis macqueenii without hunting controls”  where further interpretation of the population-level consequences of these mortality causes can be found. Taxonomy dependent, four amphibian (three toads and a frog) and 57 reptile species (a tortoise, 36 lizards and 20 snakes) appear confirmed as occurring within the Republic of Uzbekistan. One of these species,Szczerbak’s even-fingered gecko Alsophylax szczerbaki, has perhaps been extirpated. The presence of a further two taxa, i.e., long-legged bent-toed gecko Tenuidactylus longipes and multi-ocellated racerunner Eremias multiocellata is unclear (but both probably absent), whilst the standing of Turkestan salamander Hynobius turkestanicus remains an enigma. Species distributions in Uzbekistan are summarised based on a literature review supplemented by recent field observations. Nest-site choice profoundly influences reproductive success and the survival of incubating adults. Asian Houbara (Chlamydotis macqueenii) nest in subtly contrasting habitats where the main cause of nest failure is predation. We examined nest-site selection across three semi-arid shrub habitats that differed in vegetation structure and hypothesized that increased concealment would reduce nest predation. We quantified vegetation structure at 210 nests and 194 random control sites at two scales, the ‘nest area’ (50 m-radius, considering mean ‘shrub height’ and mean ‘shrub frequency’) and ‘nest scrape’ (2 m-radius, considering a ‘concealment index’). Variance ratio tests showed variance in both shrub height and concealment index were lower at nests than at random sites, indicating non-random selection. Analysis of the probability of nest occurrence for nest area indicated consistent selection of intermediate shrub heights (shrub height + shrub height2) in the Astragalus, Salsola arbuscula and S. rigida shrub assemblages (29.5–31.5 cm), although this was not supported statistically in S. rigida as the vegetation available was already similar to the optimal nest structure. Nest survival analysis, controlling for date, showed that shrub height (but not its quadratic term) in the nest area reduced nest predation rate. Females likely traded off nesting in even taller shrubs that may confer greater nest success against the ability to see approaching danger and thus to reduce the risk of being depredated themselves (head height during vigilance when incubating is ~30cm), as we have no records of females being depredated on the nest. At the nest scrape, females strongly selected better concealed locations, although the concealment index did not affect nest success. We suggest that concealing the scrape among shrubs may have other roles, such as thermoregulation. The remaining Indochina population of the Critically Endangered Bengal florican Houbaropsis bengalensis breeds in the floodplain of Cambodia’s Tonle Sap Lake. The population has declined substantially but survival rates have not been published previously. Survival could potentially be reduced by the planned construction of high-tension power transmission lines that may begin in 2016. Using data from 17 individuals monitored by satellite transmitters over 4 years we estimated the annual adult survival rate to be 89.9% (95% CI 82.2–97.6%), which is comparable to that of other bustards. Interrogation of movement paths revealed that for the 13 individuals for which we had sufficient data for non-breeding seasons, all annual migration routes between breeding and non-breeding areas crossed the proposed route of the transmission line. The route also impinged on the margins of one important and one minor breeding concentration. A review of bustard collision rates confirmed the vulnerability of bustards to power lines, and the proposed development therefore presents an additional threat to the future of this species in Indochina. For migratory species, the success of population reintroduction or reinforcement through captive‐bred released individuals depends on survivors undertaking appropriate migrations. We assess whether captive‐bred Asian Houbara Chlamydotis macqueenii from a breeding programme established with locally sourced individuals and released into suitable habitat during spring or summer undertake similar migrations to those of wild birds. Using satellite telemetry, we compare the migrations of 29 captive‐bred juveniles, 10 wild juveniles and 39 wild adults (including three birds first tracked as juveniles), examining migratory propensity (proportion migrating), timing, direction, stopover duration and frequency, efficiency (route deviation), and wintering and breeding season locations. Captive‐bred birds initiated autumn migration an average of 20.6 (±4.6 se) days later and wintered 470.8 km (±76.4) closer to the breeding grounds, mainly in Turkmenistan, northern Iran and Afghanistan, than wild birds, which migrated 1217.8 km (±76.4), predominantly wintering in southern Iran and Pakistan (juveniles and adults were similar). Wintering locations of four surviving captive‐bred birds were similar in subsequent years (median distance to first wintering site = 70.8 km, range 6.56–221.6 km), suggesting that individual captive‐bred birds (but not necessarily their progeny) remain faithful to their first wintering latitude. The migratory performance of captive‐bred birds was otherwise similar to that of wild juveniles. Although the long‐term fitness consequences for captive‐bred birds establishing wintering sites at the northern edge of those occupied by wild birds remain to be quantified, it is clear that the pattern of wild migrations established by long‐term selection is not replicated. If the shorter migration distance of young captive‐bred birds has a physiological rather than a genetic basis, then their progeny may still exhibit wild‐type migration. However, as there is a considerable genetic component to migration, captive breeding management must respect migratory population structure as well as natal and release‐site fidelity. As satellite-derived normalized difference vegetation index (NDVI) is related to vegetation biomass, it may provide a proxy for habitat quality across extensive species ranges where ground-truth data are scarce. However, NDVI may have limited accuracy in sparsely-vegetated arid and semi-arid environments due to signal contamination by substrate reflectance. To validate NDVI as a vegetation proxy in the low-altitude deserts of Central Asia, we examine its response to precipitation across the migratory corridor of Asian Houbara Chlamydotis macqueenii, a threatened gamebird occupying deserts from the Middle East to China. Restricting NDVI data by altitude (masking higher elevations unoccupied by n=61 satellite-tracked houbara) and 2009 Globcover land cover (excluding cropland and built-up area), we relate moderate-resolution imaging spectroradiometer (MODIS) NDVI data to Global Precipitation Climatology Project precipitation data across five World Wildlife Fund semi-arid ecoregions (totaling 4.06 million km2). We examine this both spatially (per 1 degree cell, mean annual NDVI and mean precipitation over 16 years, 2000–2015); and temporally (annual NDVI and annual precipitation) using separate temporal General Linear Models per cell and an overall Generalized Linear Mixed Model (GLMM) (including cell ID as a random effect). We sought to explain spatial variation in the NDVI-precipitation relation among temporal per degree-cell models, in terms of the slope (strength) and adjusted (adj.) R2 (explanatory power), using inter-annual mean NDVI (2000–2015) and Gridded Livestock of the World livestock density. NDVI increases with precipitation, both spatially (adj. R2 = 0.58, p < 0.001) and temporally (mean adj. R2 across n=244, 1 degree cells = 0.44; GLMM across cells p< 0.001). More vegetated regions show a stronger temporal response of vegetation biomass for a given precipitation increment (slope of NDVI to precipitation in per cell temporal models increases with inter-annual mean NDVI; adj. R2 = 0.38, p < 0.001), reinforcing the conclusion that NDVI provides a proxy for vegetation abundance. The slope of this relation did not differ among ecoregions. Although livestock density is generally assumed to degrade vegetation and weaken the NDVI-precipitation relationship, explanatory power (adj. R2 of per cell NDVI-precipitation models) is weakly, but positively, related to livestock density (adj. R2 = 0.02, p = 0.011). This may be because we assess livestock at a coarse grain, at scales where overall stocking density is positively associated with vegetation abundance, but may also indicate that livestock are not degrading vegetation at regional landscape-scales despite potential localized effects. The strong signature of rainfall shows MODIS NDVI offers a potentially powerful proxy for spatial and temporal variation in arid and semi-arid vegetation at a resolution of 1 degree and 1 year over the houbara’s breeding and wintering range, and probably also at finer spatial resolutions. NDVI can therefore be used in analyses relating (a) staging and wintering site selection to variation in habitat among potential wintering locations, and (b) variation within and between localities to demographic carry-over effects. Landscape-scale habitat and land-use influences on Asian Houbara Chlamydotis macqueenii (IUCN Vulnerable) remain unstudied, while estimating numbers of this cryptic, low-density, over-hunted species is challenging. 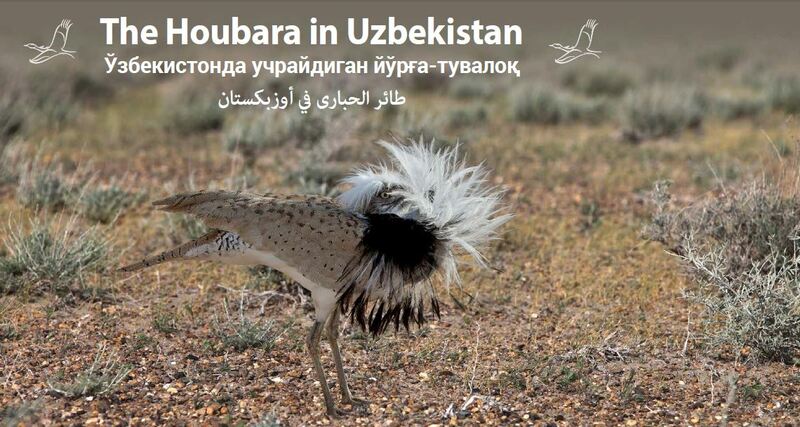 In spring 2013, male houbara were recorded at 231 point counts, conducted twice, across a gradient of sheep density and shrub assemblages within 14,300 km² of the Kyzylkum Desert, Uzbekistan. Four sets of models related male abundance to: (1) vegetation structure (shrub height and substrate); (2) shrub assemblage; (3) shrub species composition (multidimensional scaling); (4) remote-sensed derived land-cover (GLOBCOVER, 4 variables). Each set also incorporated measures of landscape rugosity and sheep density. For each set, multi-model inference was applied to generalised linear mixed models of visit-specific counts that included important detectability covariates and point ID as a random effect. Vegetation structure received strongest support, followed by shrub species composition and shrub assemblage, with weakest support for the GLOBCOVER model set. Male houbara numbers were greater with lower mean shrub height, more gravel and flatter surfaces, but were unaffected by sheep density. Male density (mean 0.14 km-2, 95% CI, 0.12‒0.15) estimated by distance analysis differed substantially among shrub assemblages, being highest in vegetation dominated by Salsola rigida (0.22 [CI, 0.20‒0.25]), high in areas of S. arbuscula and Astragalus (0.14 [CI, 0.13‒0.16] and 0.15 [CI, 0.14‒0.17] respectively), lower (0.09 [CI, 0.08‒0.10]) in Artemisia and lowest (0.04 [CI, 0.04‒0.05]) in Calligonum. The study area was estimated to hold 1,824 males (CI: 1,645‒2,030). The spatial distribution of relative male houbara abundance, predicted from vegetation structure models, had the strongest correspondence with observed numbers in both model-calibration and the subsequent year’s data. We found no effect of pastoralism on male distribution but potential effects on nesting females are unknown. Density differences among shrub communities suggest extrapolation to estimate country- or range-wide population size must take account of vegetation composition. To inform population support measures for the unsustainably hunted Asian houbara Chlamydotis macqueenii (IUCN Vulnerable), we examined potential habitat and land-use effects on nest productivity in the Kyzylkum Desert, Uzbekistan. We monitored 177 nests across different semi-arid shrub assemblages (clay-sand and salinity gradients) and a range of livestock densities (0–80 km−2). Nest success (mean 51.4 %, 95 % CI 42.4–60.4 %) was similar across 4 years; predation caused 85 % of those failures for which the cause was known, and only three nests were trampled by livestock. Nesting begins within a few weeks of arrival when food appears scarce, but later nests were more likely to fail owing to the emergence of a key predator, suggesting that foraging conditions on wintering and passage sites may be important for nest productivity. Nest success was similar across three shrub assemblages and was unrelated to landscape rugosity, shrub frequency or livestock density but was greater with taller mean shrub height (range 13–67 cm) within 50 m. Clutch size (mean = 3.2 eggs) and per-egg hatchability in successful nests (87.5 %) did not differ with laying date, shrub assemblage or livestock density. We therefore found no evidence that livestock density reduced nest productivity across the range examined, while differing shrub assemblages appeared to offer similar habitat quality. Asian houbara appear well-adapted to a range of semi-desert habitats and tolerate moderate disturbance by pastoralism. No obvious in situ mitigation measures arise from these findings, leaving regulation and control as the key requirement to render hunting sustainable. Survival rates of captive-bred Asian Houbara Chlamydotis macqueenii in a hunted migratory population. Asian Houbara Chlamydotis macqueenii numbers are declining owing to unsustainable levels of hunting and poaching, with the main conservation response being population reinforcement through the release of captive-bred birds. We assessed the contribution of captive breeding to the species’ conservation by examining the fates of 65 captive-bred birds fitted with satellite transmitters and released during spring (March–May) and autumn (August) into breeding habitat in Uzbekistan. Of the released birds, 58.5% survived to October, the month favoured by Emirati hunters in Uzbekistan, but only 10.8% of those released survived the winter to return as sub-adults next spring. To mitigate and compensate the loss of wild adults to hunting, the number of released birds needs to be an order of magnitude higher than hunting quotas (with a release of between 1640-1920 required for a hypothetical quota of 200), indicating that releases may be costly and do not remove the need for a biologically determined sustainable hunting quota. Nineteen avian mortalities were recorded involving 10 different species of predominantly large birds. Fourteen mortalities were observed during transects, giving a probability of finding one carcass in a 1 km section as 5.8% (95% CI 3.8‒7.9%), although a seasonal rate of mortality cannot be estimated as the age could not be verified for most carcasses. In general, we concluded that the large raptors mostly died from electrocution, as many were found right under pylons of low-voltage distribution lines, although some were farther away from the lines and might instead have been victims of collision. The Asian Houbara remains observed during the transects under a high-voltage transmission line, being between pylons and away from the lines, were certainly the result of collision. Overall, mortalities of all species were distributed widely, although one 40 km stretch of distribution line yielded five mortalities. Opportunistic observation revealed an additional one Asian Houbara, one Steppe Eagle Aquila nipalensis and one Steppe Buzzard Buteo buteo vulpinus mortality on low-voltage transmission powerlines, while satellite PTTs disclosed two Asian Houbara mortalities, one wild adult female colliding with low-voltage distribution lines during post-breeding movements and one captive-bred female hitting a high-voltage transmission line during migration. Based on monitoring 24 wild adult Houbaras with a cumulative total of 5930 days monitored in Uzbekistan and one recorded powerline collision gives a monthly probability of hitting a powerline per individual of 0.51% ± 0.50% SE. Thus over the period 1 April–1 October, an individual had a 3.0% (95% CI: 0.0–9.0%) probability of powerline mortality. Houbaras seem relatively vulnerable to scavengers (usually confirmed as red fox Vulpes vulpes, by the presence of scats), as all evidence found consisted merely of remnants of feathers under the powerline, whereas eagle and buzzard carcasses were generally intact. 1. When species face extinction, captive breeding may be appropriate. However, captive breeding may be unsuccessful, while reducing motivation and resources for in situ conservation and impacting wild source populations. Despite such risks, decisions are generally taken without rigorous evaluation. We develop an individual-based, stochastic population model to evaluate the potential effectiveness of captive-breeding and release programmes, illustrated by the critically endangered Ardeotis nigriceps Vigors Great Indian Bustard. 2. The model was parameterized from a comprehensive review of captive breeding and wild demography of large bustards. To handle uncertainty in the standards of captive-breeding performance that may be achieved, we explored four scenarios of programme quality: ‘full range’ (parameters sampled across the observed range), ‘below average’, ‘above average’ and ‘best possible’ (performance observed in exemplary breeding programmes). Results are evaluated examining: (i) the probability of captive population extirpation within 50 years and (ii) numbers of adult females subsequently established in the wild following release, compared to an alternative strategy of in situ conservation without attempting captive breeding. 3. Successful implementation of captive breeding, involving permanent retention of 20 breeding females and release of surplus juveniles, required collection of many wild eggs and consistent ‘best possible’ performance across all aspects of the programme. Under ‘full-range’ and ‘above-average’ scenarios, captive population extirpation probabilities were 73–88% and 23–51% respectively, depending on egg collection rates. 4. Although most (73–92%) ‘best possible’ programmes supported releases, re-establishment of free-living adults also required effective in situ conservation. Incremental implementation of effective conservation measures over the initial 10 years resulted in more free-living adults within 35 years if eggs were left in the wild without attempting captive breeding. 5. Synthesis and applications. For the great Indian bustard Ardeotis nigriceps, rapid implementation of in situ conservation offers a better chance to avoid extinction than captive breeding. Demographic modelling of threatened species should be used to examine whether captive breeding will bring net benefits to conservation programmes. Do sheep affect distribution and habitat of Asian Houbara Chlamydotis macqueenii? We examined whether pastoralism affected the distribution of Asian Houbara Bustard Chlamydotis macqueenii (IUCN Vulnerable) or modified its habitat across 14,500 km2 of the Kyzylkum Desert, Uzbekistan. In this landscape, sheep grazing is constrained by access to water, allowing effects to be examined independent of topography and vegetation community. Across a gradient of sheep density (0–10 to 30–80 individuals km−2) we achieved n = 140 10-km driven transects (total driven 3500 km). On all transects Houbara and sheep were surveyed at least once, and 96 were driven three times with vegetation sampled on four 50 m-long transects along each of these (measuring 7493 shrubs). Houbara distribution and abundance was also recorded at 147 point counts. In Generalised Linear Models that controlled for plant community, neither interpolated sheep density (within 1 km buffers) nor topographic variation affected houbara incidence on transects, or incidence and abundance at point counts. Although subtle effects were found for some palatable shrubs, sheep did not strongly modify shrub composition or structure at landscape scales. At landscape-scales, livestock browsing has not widely degraded these rangelands, which appear sustainably managed or even under-utilised. Pastoralism and houbara conservation may therefore be compatible, although impacts on nesting females require investigation. This lavishly illustrated book explores the ecology and conservation of the Asian Houbara and the natural history of the Kyzlkum desert. Internationally renowed wildlife photographer and publisher Andy Swash spent a spring in Bukhara, his photographs are complemented by our research team. Text translated in Arabic, Uzbek and English offers the first accessible account of the rich biodiversity of the region. We plan to offer an on-line version of this book soon.